I believe in God. I believe He actually came to earth, in the flesh as Jesus Christ, because He loved each of us so much. I believe in The Bible, as the inspired, inerrant Word of God. I believe it is the world’s greatest book and the more we read it and hear it, the better chance we have of applying it to our daily life. 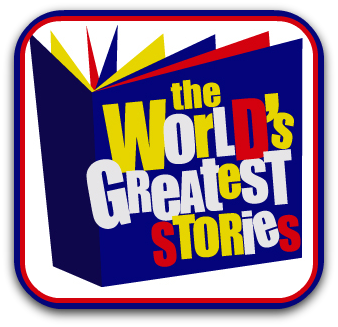 The World’s Greatest Stories are quoted directly, word for word, from The Bible, and narrated by master storyteller, George W. Sarris. These stories are true to the words of Scripture and they are dynamically, vocally illustrated by Mr. Sarris. He captivates your attention, while The Word of God is being spoken into your Spirit! 23 stories covered in approximately 6 hours of audio! Each CD is $7.95, and is available in the King James Version (KJV) and the New International Version (NIV) of The Bible. The investment is minimal, especially in light of the eternal value. It’s my opinion that this is an outstanding Biblical resource! You can read additional opinions, written by my TOS crew mates, when you click on the graphic below.